I puzzled a little over the hippo, but Carol thinks it refers to a hippo in the Nile River. So a pun is intended, as the President is "in (denial)." Get it? Hippos are in the Nile River. 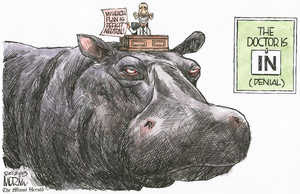 Obama is sitting on a Hippo that is in the Nile River. He is in denial. But that's a risky pun, because "de" could be taken as a dialect for the word "the," as in "de Nile" for "the Nile." That has racial overtones, arguably. Furthermore, hippos are in Africa, and Obama's father is an African. Yet we all know that most criticism of the President is racially grounded. Not.